For Masaya, the last happy memory with his parents together, is his hopelessly drunk Dad forcing him to eat yakitori chicken bars… and being hit by Mom… Masaya was 3 years old at that time. Mom and Masaya left Dad and started living in a town famous for coal mining.Mom worked in her sister’s small diner and raised Masaya by herself.The life was peaceful there, free from Dad. After graduating from high school,Masaya successfully entered an Art University in Tokyo, the place he has always longed to be. However, life never really goes on as a person wishes. His life was rotten. Life was all about fooling around with his friends and killing time.He could not dare call Mom to tell her his situation. It is now 1990, and Masaya is working just to return the debt, which were mounted while just living in Tokyo and doing nothing. He did whatever he was asked to do, and without really expecting, somehow earned his living as an illustrator/columnist. One day he gets a call from his aunt informing that his mom has cancer.Masaya makes up his mind and calls Mom, to invite her to live with him. Mom arrives in Tokyo. After living apart for 15 years,Masaya and Mom start living together in Tokyo. Masaya's life seems to have finally started moving once again. Soon, people around him started to frequently gather at his house to eat her delicious food. The house is always filled with happy faces and laughter. However, nothing lasts forever.As they have feared,Mom’s cancer has relapsed. Based on a national best-seller auto-biography (sold over 2 million copies) by Lily Franky. Ki Jan 30 2011 12:48 pm In “Tokyo Tower Mom & Me and Sometimes Dad” the movie criss-crosses through time with flashback scenes to depict the relationship between Masaya (Joe Odagiri) and his mother Eiko (Kirin Kiki). When Masaya was three years old, his mother left his irresponsible father and took Masaya to live with her in the small rural town of Chikuho. There he grew up as something of an odd child, easily scared by sounds, but enjoyed such things as tying frogs to train tracks. When it’s time for Masaya to attend high school, he attends a school that’s a long train ride away from his home. For the first time Masaya lives away from his mother and he takes a decided slacker approach to life (just like his father). During this time, it also becomes apparent that Masaya has a talent for the arts, but he seems to lack the motivation to become successful. When its time for Masaya to attend college he elects to attend a university in Tokyo which is even further away from his hometown and his mom. Throughout this time, Eiko supports Masaya unconditionally, working late hours as a cook to support his studies. In Tokyo, Masaya takes after his father even more by living a carefree life as a bohemian slacker. He often poaches off of loan sharks and when that avenue becomes dry he poaches off his mother. Soon Masaya finds himself completely broke and all alone in Tokyo. Then Masaya learns that his mother has become seriously ill. The news serves as a sort of wake up call for Masaya. He then slowly starts to put his life together. A few years later, Masaya becomes a successful illustrator and he invites his mother to live with him in Tokyo. Unfortunately, they find out that their time together may be fleeting. 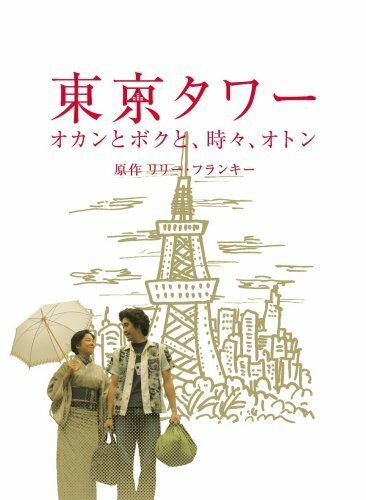 â€œTokyo Towerâ€ is based on the best selling novel by Lily Franky. More than 2 million copies has been sold to date and the novel has also inspired a television show and play. I can’t vouch for the novel as I haven’t read it, but the movie at least opts to connect with the viewers through realistic moments of life shown between the mother and son, rather than forcing inflated sentimental moments upon the viewer. What really works in the film is the second half of the film where the adult Masaya (Joe Odagiri) lives with his now ill mother. These moments are fresh in cinematic terms, not something you see often in films, and also moving in human terms, as the once irresponsible Masaya tries to make amends for his past. All the while, Eiko shows unconditional love for her son. The earlier parts of the film, with its many flashback scenes, felt more like a collection of introductory scenes made strictly to lay the groundwork for the second half of the film, rather than existing as genuinely interesting segments on its own. The film also offers plenty of star power. Beyond Joe Odagiri and Kirin Kiki, there’s plenty of cameo appearances by such notable actors as Ayumi Ito, Aoi Miyazaki, Kyoko Koizumi, Ken Mistuishi, Takako Matsu, YosiYosi Arakawa, and Susumu Terajima. Kirin Kiki turned in the best performance of the lot, giving a truly memorable performance without any unneeded histrionics. Joe Odagiri was on the money for most of his screentime, though it seemed he came up a tad short on a few of the more emotionally demanding scenes toward the end of the film. “Tokyo Tower Mom & Me and Sometimes Dad” takes a leisurely 142 minutes to tell its story and leaves out the forced dynamics that you may expect in such films. Because of this, the movie may or may not connect as well with foreign audiences. What the movie gets right (especially in the second half) is to remind you how priceless parental relationships are and to savor such moments. You would think its an obvious thing, but after watching “Tokyo Tower Mom & Me and Sometimes Dad,” it’s doubtful that anybody can take such moments for granted … if time still allows for such moments to exist.